At this point, the readers are not yet introduced to the characters or the story surrounding them, so this scene serves as an exposition and a starting point to which Lockwood’s curiosity is sparked. The presence of the supernatural adds to the gothic theme of the novel but readers are left wondering if it was actually just a nightmare. Since Lockwood is the narrator at this point, he is biased to his own senses and is further an unreliable narrator rather than an omniscient one. It could be that Lockwood was influenced by his gothic, mysterious and unnerving surroundings at Wuthering Heights and that could have in turn manifested itself in form of a nightmare. However, readers are led to doubt Lockwood’s reliability as the supernatural could have been physically present and not a nightmare as he may lead the reader to assume. Brontë’s word choice adds to the gothic theme, with her choice of words that express fear, horror and madness. The violence displayed by Lockwood in this scene could be a foreshadowing of the violence that is to continue throughout the novel. Heathcliff’s reaction to Lockwood’s vision leads the reader to question more the reliability of Lockwood. On the other hand, it also gives the reader a glimpse of Heathcliff beyond his rough exterior. Heathcliff’s weakness is Cathy and their love does board on the supernatural itself. Here Heathcliff urgently invites the ghost of Cathy as if wanting to be haunted by her. At this point, Cathy confesses her hidden feelings for Heathcliff to Nelly Dean. She admits to sincerely loving Heathcliff and how their souls are one. This also works with Brontë’s theme of the supernatural and the spiritual connection that they both share. Cathy uses natural elements, such as fire and lightning, to describe the wild and dangerous nature of her and Heathcliff. Meanwhile, Edgar’s soul is compared to that of a quiet and tame moonbeam or frost. This contrast is also a theme in Brontë’s novel, as there is often a contrast between the tamed and the wild, the civilized and the barbaric, Thrushcross Grange and Wuthering Heights. In essence, this quote shows the true passion and connection they both have. But in the end, Heathcliff cannot give Cathy the social status that she desires and so chooses to marry Edgar for superficial reasons. In this scene, Cathy links her existence to that of Heathcliff’s and further explains that she would not be a part of a world where he would not exist. Their connection is that of an obsessive yet spiritual kind. She goes on to compare her love for Edgar to the changing foliage and compares her love for Heathcliff to unchanging rocks. She states the fact that her love for Heathcliff is as strong and deep rooted as the rocks, meanwhile, her love for Edgar is temporary like the leaves in the woods. Cathy’s wild character is constantly visible through her imagery which is almost always connected to nature and wilderness. This quote is said upon Cathy’s death. 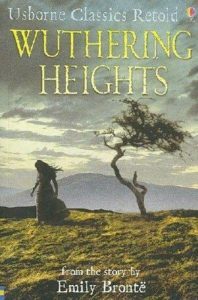 Heathcliff is filled with hatred and despair upon the loss of his soulmate and is desperate for her existence in his life. He prays she may not rest while he’s alive and invites her to haunt him with her presence until the day he dies. This refers back to the ghost and the theme of the supernatural that was present at the start of the novel, as well as the spiritual connection that is present between both characters throughout the novel. Heathcliff refers to Cathy as his soul and indeed he does lose his soul upon losing Cathy, which make the character cold and heartless enough to carry out such a series of revenge.